The Arm-A-Dor A101-002 Automatic Relock Exit Device with alarm fits door widths of 3’ to 4’ and jamb.. The Arm-A-Dor A101-013 Automatic Relock Exit Device with alarm fits door widths of 3’ only and jambs..
Arm-A-Dor A103-003 Alarm Sub-Assembly. This revolutionary panic exit hardware is built for sec.. 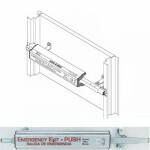 This Arm-A-Dor A101-F02 is a automatic fire rated, maximum security exit device with alarm. .. The Arm-A-Dor A102-002 Manual Relock Exit Device with alarm fits door widths of 3’ to 4’ and jambs u.. The Arm-A-Dor A104-001 Low-Profile Installation Kit for door jambs greater than 6-3/4” and up to 12-.. The Arm-A-Dor A101-001 Automatic Relock Exit Device without alarm fits door widths 3’ to 4’ and jamb.. The Arm-A-Dor A101-012 Automatic Relock Exit Device without alarm fits door widths of 3’ only and ja.. The Arm-A-Dor A102-001 Manual Relock Exit Device without alarm fits door widths of 3’ to 4’ and jamb.. The Arm-A-Dor A106-001 Standard Double Door Kit for jambs up to 6-3/4”. This revolutionary pan.. The Arm-A-Dor A107-001 AC Adapter Kit for plug in battery back-up. This revolutionary panic ex.. The Arm-A-Dor A103-002 Rx Switch Kit for wiring to existing systems (one individual kit). This.. 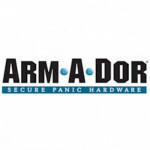 This Arm-A-Dor A101-005 is a Auto relock exit with alarm. It is a alarmed maximum security exit ..
Arm-A-Dor A101-006 Auto reloc exit wth alarm. A maximum security exit device. Auto relock ex.. This is a Arm-A-Dor A101-015 auto relock exit with alarm. A alarmed maximum security exit device.. The Arm-A-Dor A101-028 is a auto relock exit with alarm and cylinder. With a A101-002 W/ilco 718.. This Arm-A-Dor A101-030 is auto relock with alarm and cylinder. This is exit alarm. Wit.. This Arm-A-Dor A101-F01 is a Automatic fire rated exit with no alarm. Fire rated maximum securit..